You may have wondered if substituting turkey sausage for pork sausage is worth the nutritional value. If you're looking for fewer calories and less fat and sodium, yet more of every other essential mineral, it is definitely worth substituting turkey for pork. Turkey sausage also contains more protein and a higher percentage of the dietary reference intake, or DRI, for many vitamins than pork sausage. DRI percentages listed are based on recommended daily values for adults under age 50. A 100 g, or about 3.5 oz. serving of turkey sausage contains 196 calories, which is almost half of the 339 calories in the same serving of pork sausage. About half of the calories in one serving of turkey sausage come from protein. One serving contains 23.9 g of protein, which is 52 percent of the DRI of 46 g for women. Men require more protein, 56 g, so one serving of turkey sausage provides 43 percent of the DRI for men. Pork sausage provides less protein, with 35 percent of the DRI for men and 42 percent for women per serving. The other half of the calories in one serving of turkey sausage come from fat, of which there are 10.4 g. Pork sausage contains nearly three times the amount of fat, with 28.4 g per serving. 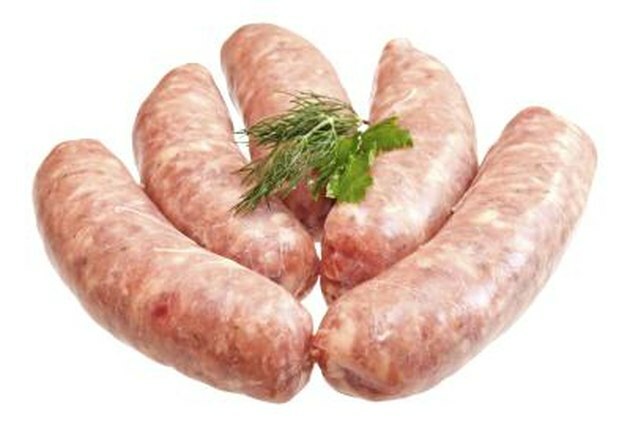 Turkey sausage is also much lower in saturated fat with 2.3 g per serving compared to 9.2 g per serving for pork sausage. Because saturated fat can contribute to plaque on the artery walls, turkey sausage is a far better nutritional choice if you are at risk for heart disease. Turkey sausage is somewhat lower in sodium than pork sausage, with 665 mg as opposed to 749 mg. The maximum recommended daily intake for sodium is 2,300 mg. One serving of turkey sausage provides 28 percent of this amount and one serving of pork sausage provides 31 percent of this amount. Although you need sodium for proper nerve and muscle function, too much can lead to health issues such as high blood pressure. In this area, turkey sausage is an improvement over pork, but not a huge one. In addition to sodium, turkey sausage contains significant amounts of other minerals, including phosphorus, potassium and zinc. One serving supplies 29 percent of the DRI for phosphorus, 15 percent for potassium and more than 30 percent for zinc for both men and women. Zinc supports your immune system and helps you taste and smell properly. Pork sausage contains less of all three of these minerals, especially zinc. One serving supplies 26 percent of the DRI for women but only 19 percent for men. Turkey sausage is low in vitamin C and all of the fat-soluble vitamins, but it contains larger amounts of some B vitamins. One serving provides more than 50 percent of the DRI of B-12, more than 30 percent of niacin and more than 20 percent of B-6, pantothenic acid and riboflavin. Pork sausage contains similar amounts of all B vitamins, with slightly more niacin and slightly less riboflavin than turkey sausage.